When Devin Hentz came to Carnegie Mellon University's Summer Academy for Math and Science (SAMS) program, he knew he was going to sharpen his academic skills. But he didn't expect to meet President Barack Obama, who stopped by CMU's Pittsburgh campus as part of his "Betting on America" bus tour. 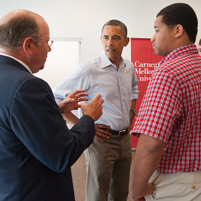 Hentz welcomed Obama, who was also greeted by CMU President Jared L. Cohon, faculty member Gary Fedder, technical co-lead for Obama's Advanced Manufacturing Partnership (AMP), and student body president Will Weiner. "President Obama was really interested in CMU's SAMS program," Hentz said. "He told me we need more math and science majors in the world. It was great to meet him, but it was kind of surreal." CMU's SAMS program is for junior and senior high school students with a strong interest in math and science and a strong drive to excel. It is designed to build the self-confidence required to do well in technical degree programs at top-ranked universities like CMU. Through hands-on engineering and science projects, the students work side by side with CMU's expert faculty, applying the concepts and principles that are part of the summer curriculum. Hentz, a rising senior from Fort Washington, Maryland, plans to study computer science in college in hopes of achieving his dream to become a video game developer. Obama spoke at a grassroots campaign event held on the College of Fine Arts (CFA) lawn. "We've got to invest in our young people so they get the best education," Obama noted, adding that, "A higher education is an economic necessity." CMU's SAMS program, with its challenging academic environment and peer support, addresses the need Obama raised for more math and science majors. SAMS is just one of the university's summer programs offered for high school students. CMU also offers pre-college programs in architecture, art and design, drama, music, as well as the Advanced Placement/Early Admission program and the National High School Game Academy. As a 501(c)(3) nonprofit corporation Carnegie Mellon University does not support or oppose any particular candidate and maintains an open door policy to all candidates.